Easy to make and incredibly delicious! *I always have extra filling, so have more chocolate on hand. In a small bowl combine the confectioners’ sugar, peanut butter, brown sugar, butter and vanilla; cover and set aside. Place paper cups in the mini-muffin pan and put about a teaspoon of chocolate in each. 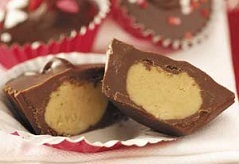 Roll the peanut butter filling into a small ball and slightly flatten into a disc. Set the peanut butter disc filling on top of the chocolate and then cover with a second teaspoon of chocolate, use spoon to smooth. If you are choosing to decorate these with sprinkles, etc, now is the time. Refrigerate to set. Once they have set a bit I remove them from the muffin pan and place them on a cookie sheet to completely set so that I can use the muffin pan to make more. If you’re melting chocolate to use in such items as chocolate covered strawberries, often times a recipe will call for added shortening. This is because the addition of shortening creates a smoother and more manageable consistency than melted chocolate alone. Doing this helps to make a more evenly coated product. The issue with water cannot be overemphasized. Whether you use a double boiler, microwave, or direct heat to melt your chocolate, you must always make sure that all of your utensils are completely dry. Any amount of moisture may cause chocolate to “seize,” or clump and harden. If this happens, add shortening using the previously prescribed ratio.